I’m not going to lie. I was never a Microsoft fan. Not even when I was using Windows (that I begrudgingly moved to after the Amiga). But at least you used to have some awe and respect for the gorilla that was Microsoft. Bill Gates might have been an evil genius, but at least he was a genius. 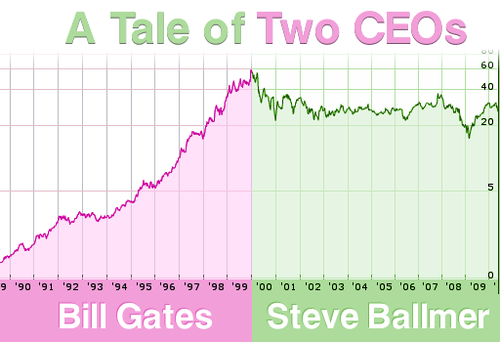 Now contrast this to Steve Ballmer. Who’s certainly no genius and calling him evil is to belittle evil. He has turned the gorilla into a buffoon. And frankly, it’s sad. Gone are the feelings of rage (except when they patent troll people for being web apps) and left is pity. None of this is new, of course. Ballmer has be running Microsoft for more than a decade now, but when you don’t hear from the guy directly for a while, it’s easy to get lulled into the belief that he’s probably running alright. Not. See this video from D8 of Ballmer babbling about “productivity is going to be important, consumption is going to be important”. It matters who’s at the top. It sets the company tone. Microsoft is undoubtedly full of very smart people, but as long as they are being run by Steve Ballmer, they’re going to be shackled by his ineptitude. I wish Microsoft had their evil genius back.